The bee might run away when a Japanese bee is kept. The cause from which a Japanese bee runs away is not understood easily. It was usual that there was a bee as the nest was never seen before. Moreover, it was confirmed that there were drones how many when do the inspect privately of the nest. This crowd was the one having gotten it from "Slow-nin" in Okayama City about one year ago. 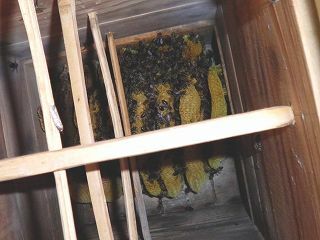 Originally, the number of bees was few crowds. This photograph is from a nest a Japanese bee to taking out the nest after several days pass after Japanese bee run away. The mark of the royal cell is seen when often seeing. Moreover, the mark ruined by the nest insect is seen. It seems that a Japanese bee decreases the number of amount of bees, and is put by the nest insect when presuming from these. In the nest after it ran away, there were neither honey nor a larva. It was only a nest and a nest insect that had. 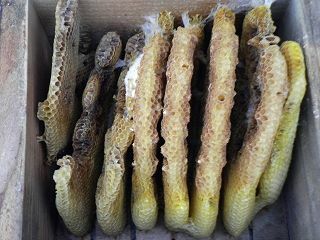 This nest was used to take propolis. The cause from which a Japanese bee ran away is not often clearly understood. However, there must be a cause in running away when often observing it. In general, it is possible for the nest to have been eaten messily by crowd small, and the nest insect, and to have received the attack of the ant. Moreover, a Japanese bee might dislike nests by the place and sunshiny of the nest-box. It is likely to run away because the environment where it lives is bad even if agricultural chemicals are scattered in the vicinity. The birdhouse might become full, and it run away even if the nest falls due to the heat. It is likely to run away even if a vespine attack is received. Anyway, I think that it is important to often observe the state of the nest-box. Some changes are sure to be noticed when observing it every day. Making the bottom plate a slide type so as not to make the attack of the nest insect easy to receive, and cleaning it frequently are also important. It is also important to remove the bottom plate, and to confirm the state in the birdhouse. If a vespine attack is received, it is also important to begin a vespine trap at the early spring, and to decrease a vespine number. When a Japanese bee that was raising it runs away, disappointment is big. Always take care of a Japanese bee well.